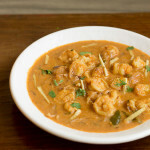 Prawns Curry South Indian Style – tastes awesome and the taste will linger in your memories forever once you taste them. 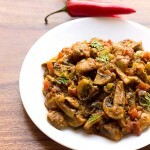 This curry has loads of coconut and Indian spices which gives an awesome taste to this curry. It’s a must try so do try Prawns Curry South Indian Style. Prawns are my favorite since childhood. I have eaten more than 100 version of prawns thanks to my mom. Coastal food have big fan following. Prawns is one of the most tempting coastal food across the world. You could use lobsters, prawns, shrimps for this Prawns Curry South Indian Style. Any size of prawns is good however medium sized prawns goes well with this kind of curry. 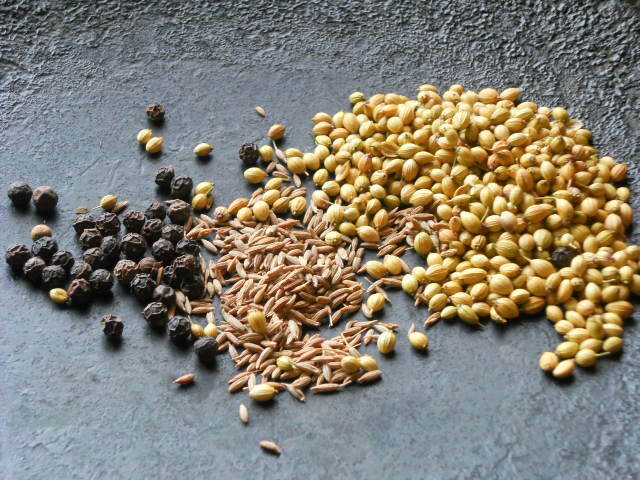 The main flavor of south Indian food are mustard seed, red chilies, curry leaves and coconut. Coconut is found in abundance in south Indian region. So coconut is used in almost all of their dishes. Coconut is a part of their life. Lucky are people from south who are blessed with coconuts. I am in love with coconut water and coconut milk. 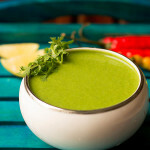 Its yummy + great for health. Anyways coming back to our Prawns Curry South Indian Style. Prawns gives a unique flavor to food. My mom had bought fresh prawns so we came up with Prawns Curry South Indian Style. As usually we make prawns in Goan style so we decided to make in South Indian style. To be honest the aroma of this curry will give you hunger cravings. This Prawns Curry South Indian Style tastes heavenly with steamed rice. I am sure you gonna love them! 1. Wash the prawns and remove the spine of prawns with the help of knife. 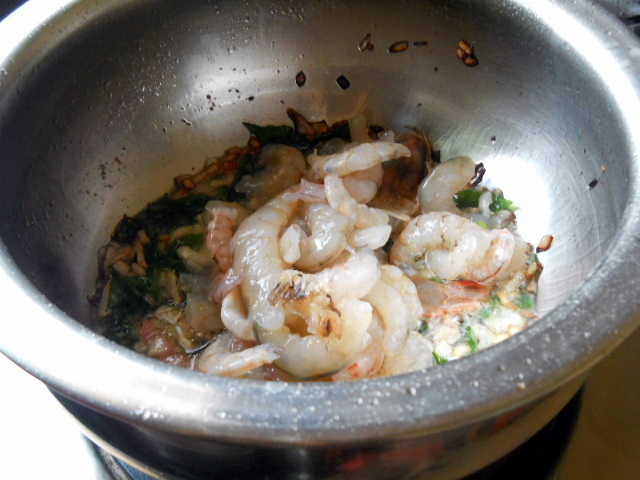 Sprinkle some salt on the cleaned prawns and keep them aside. 2. Take a pan and roast pepper corn, coriander seeds, kashmiri chilies,cumin seeds on low flame for 3 to 4 mins. 3. Combine the roasted spice along with one chopped onion, garlic cloves, fresh grated coconut. Grind them into a processor until thick paste is formed. Don’t add water. 4. 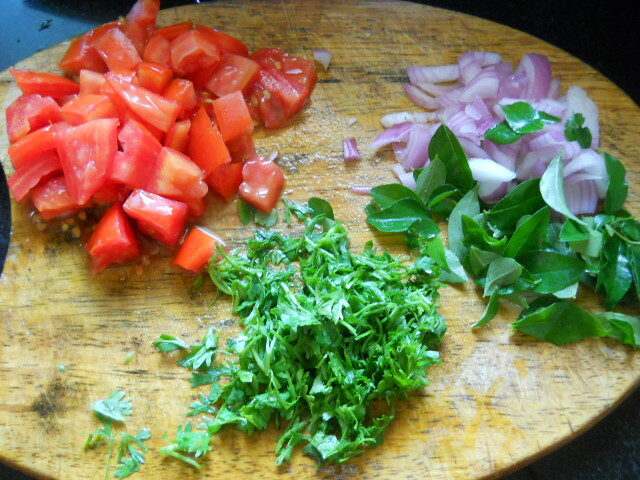 Chop tomatoes, onion and coriander leaves. 5. Take a big wok or vessel add oil. Keep the gas flame on medium mode. Once oil is hot add mustard seeds. 8. Add ginger-garlic paste along with our thick coconut masala. Stir all of them for a minute. It’s time to add tomatoes with few coriander leaves. 10. Your Prawns Curry South Indian Style is ready. Serve hot with steamed rice or pav. Garnish the curry with few coriander and curry leaves. 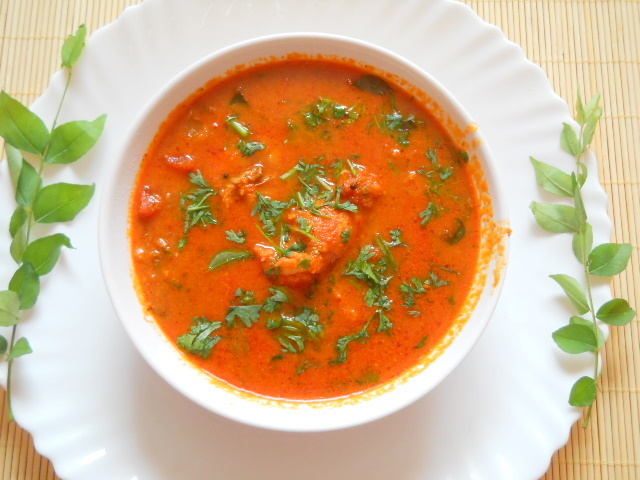 If you are fond of fish then do check Goan prawns curry, dry shrimp curry, clams dry recipe, mandeli fish fry, goan fish curry, goan prawn curry, mince potato chops, goan shark fry, green crab curry and goan piri piri sauce. 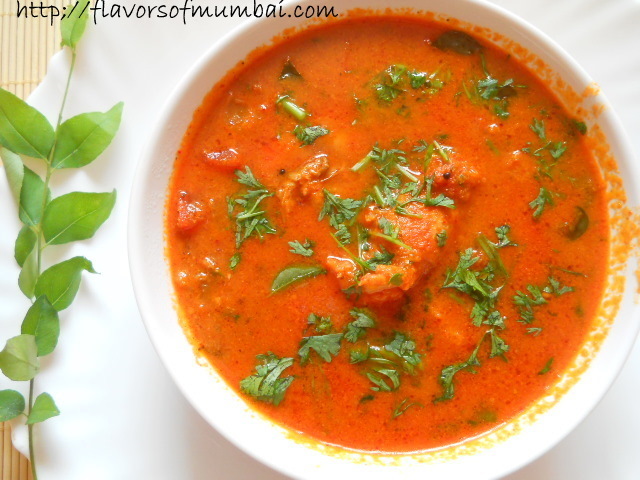 Prawns Curry South Indian Style has loads of coconut and Indian spices which gives an awesome taste to this curry. Wash the prawns and remove the spine of prawns with the help of knife. Sprinkle some salt on the cleaned prawns and keep them aside. Take a pan and roast pepper corn, coriander seeds, kashmiri chilies,cumin seeds on low flame for 3 to 4 mins. Combine the roasted spice along with one chopped onion, garlic cloves, fresh grated coconut. Grind them into a processor until thick paste is formed. Don't add water. Chop tomatoes, onion and coriander leaves. Take a big wok or vessel add oil. Keep the gas flame on medium mode. 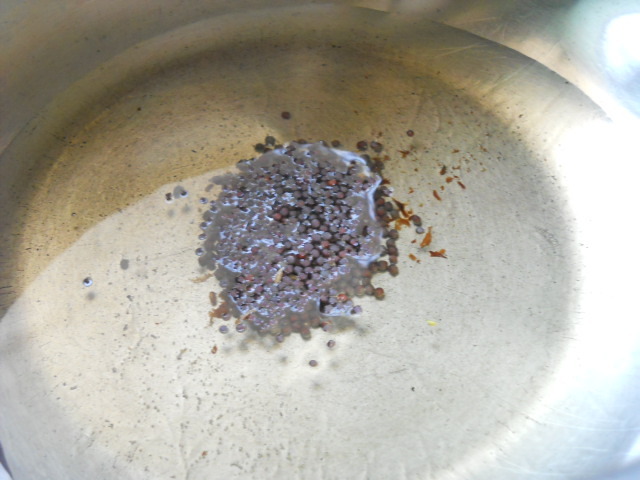 Once oil is hot add mustard seeds. 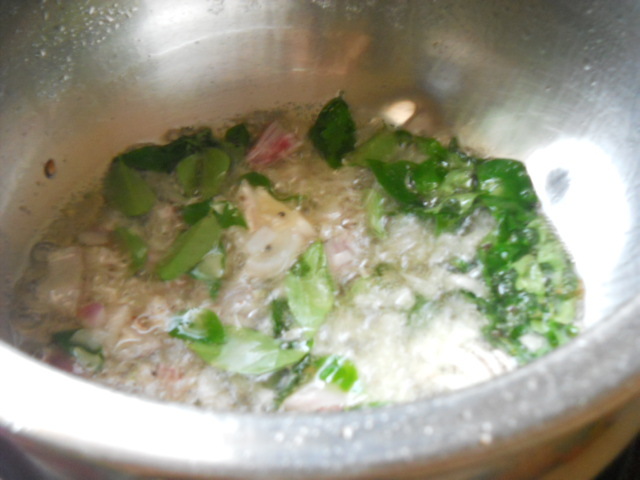 Once they crackling add chopped onion, 10 to 12 curry leaves. Saute them for about 3 to 4 mins on low flame until onion color changes to soft brown. Now add prawns to it. Let this cook for 2 mins. Add ginger-garlic paste along with our thick coconut masala. Stir all of them for a minute. It's time to add tomatoes with few coriander leaves. Add little water if required. Ideally this curry is thick and not thin. So make it as per the consistency required. For seasoning add salt to it. Sprinkle the rest of curry leaves in the curry now. Cook the curry for about 10 mins Or until prawns cook. Your Prawns Curry South Indian Style is ready. Serve hot with steamed rice or pav. Garnish the curry with few coriander and curry leaves. 1. Adding curry leaves later in the curry gives a great flavor to this curry. 2. You could make similar curry with meat, chicken or any other fish. 3. Always remove the black thread from the spine of prawns. Otherwise it will give you digestion problems. I think quantities of masala s mentioned are too much. Instead of tbsp it should be tips. My opinion. Also mustard is too much. Thank you so much its my old post have corrected the measurements. Let me know if still any doubts. I just made twice in the same week. Slight bitterness is due to crushed(Blend) onions.My really enjoyed it. Love your help as I love cooking. Pleased to know this Rahul thankyou so much 🙂 and my pleasure. I tried it…. Twas really good…. 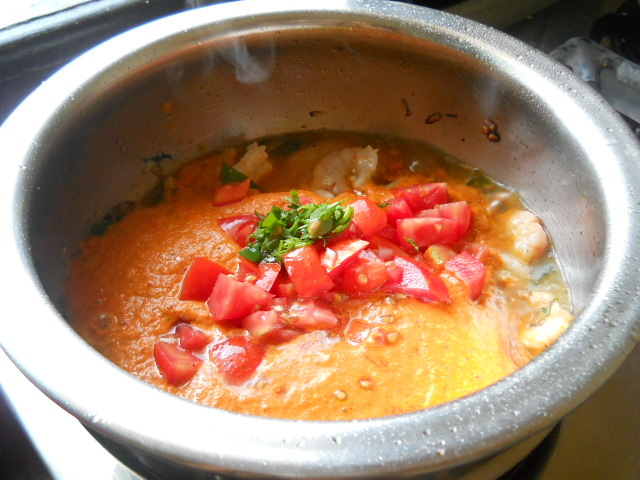 Thanx for posting…..
Thankyou Blessy for trying the prawns curry pleased to know you liked them 🙂 and you are always welcome. I made this twice now with no coconut and I didn’t grind the ingredients either. The curry was simply awesome!! Thanks for posting this great recipe. Thankyou Anusha for trying the recipe and you have zapped me by making a different version of the curry yet tasting good. Thanks and you are welcome. I would like to try it tonight. When you say 1/2 coconut, do you mean 1/2 of a whole coconut? Can grated coconut be used instead and how much? Yes half of whole coconut and grated is just fine. 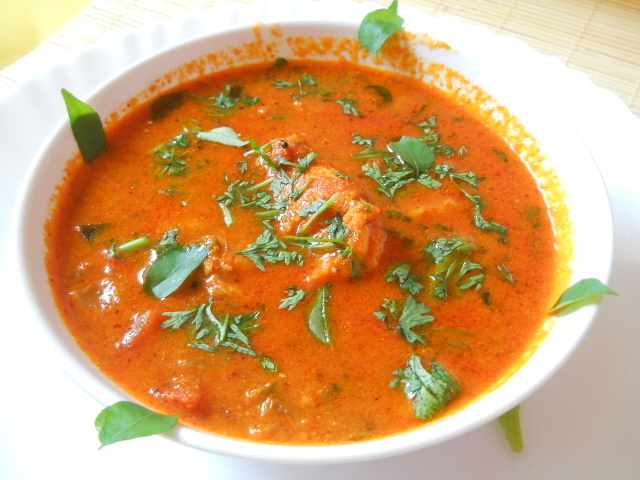 Dear Maria today only i got this site…..actually i was searching for a good prawns curry and i made it today itself for lunch…..it was really tasty and the flavour of peppercorns comes out well….how can we know the prawns are well cooked? 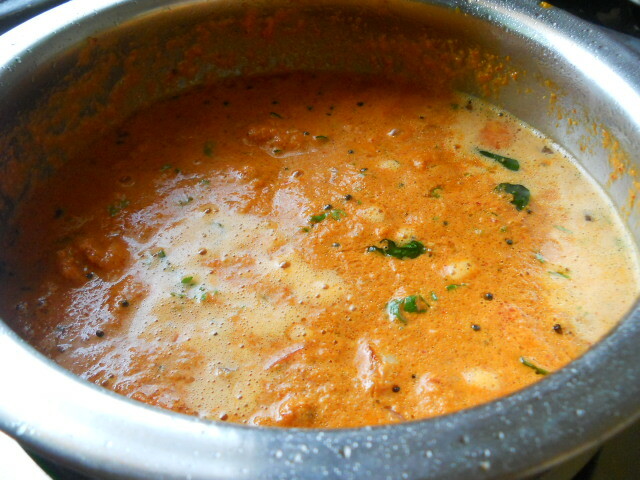 pls reply ..
Sangeetha thanks for coming here I am happy you liked the prawns curry :)…. 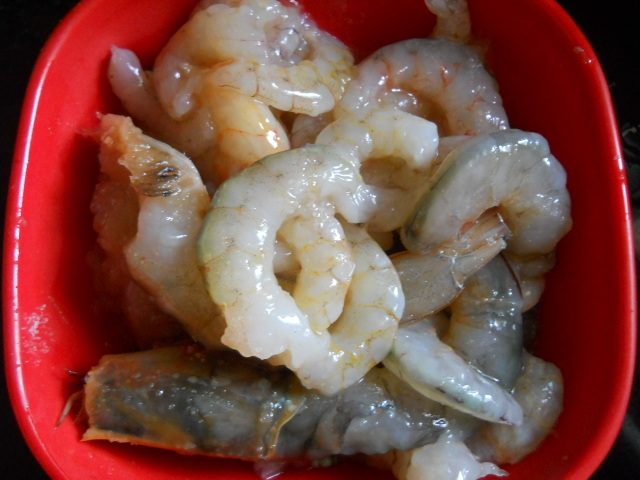 Prawns change color and become soft once cooked it cooks in 2 to 3 mins …. Hope this helps you. Makes sense about the mustard seeds and why my curry has been bitter! Thanks! You are welcome anytime Rachel 🙂 keep in touch! Good recipe. I followed the recipe properly but mine turned out a little bitter. Perhaps I should add less mustard seeds next time? Thanks! Great recipe!! Loved it!! 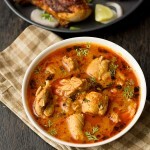 Also Maria what happened to my post on your Murgh Nawabi recipe page? Thanks Tanvi have fun girl with cooking ! Gonna try it today but can yo u tell me what is garlic cloves? garlic cloves means each garlic for instance 1 garlic , 2 garlic etc. Hi Maria, I cooked it and it was good. But i have one question. 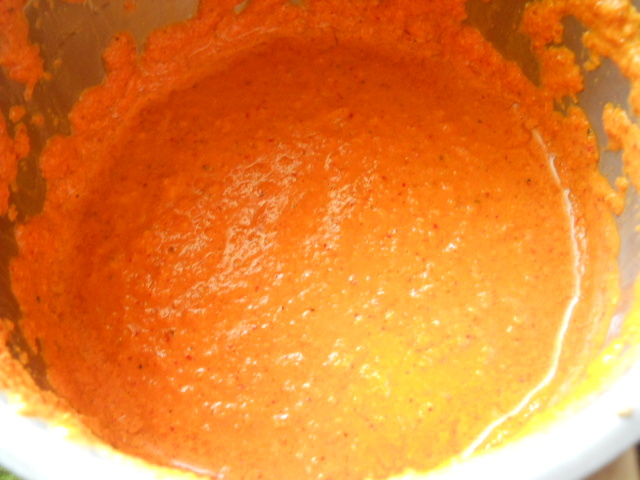 You said to make the paste do not add water whereas yours looks as if you added water, it does not look dry. I just followed your recipe otherwise and it turned out to be good. I like all your recipes and am going to try one by one all of them! Thanks for your efforts! Amita I am glad you liked it. Also I have mentioned in my instructions that you can add a little water if you require. If you wish thinner consistency you could add little water. DO try them and lemme know how were they? 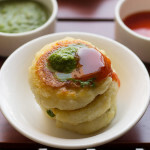 Hi, Am going to make this one today but your list of ingredients shows ginger garlic paste whereas in the pictures we do not see ginger anywhere. Please let me know. 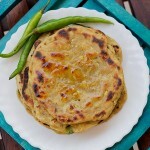 Amita ginger-garlic paste is there in the recipe but not in the pics 🙂 ….. do try and lemme know? i made this for lunch for my hubbys tiffin box minus the cocounut coz he doesnt like it and it was dam tasty i tell you very easy and qiuck to make and i really dont know what i wud have done if i had not found your site!!!!!! Great Sunita 🙂 you are becoming a great cook. If I wasn’t there Sunita you still would have been a great cook 😉 ……. You take care too dear. Absolutely beautiful!! Instead of using fresh coconut I used dried desiccated and its great! Hi Rachel thanks I am glad you liked the prawns curry 🙂 ….. yeah desiccated coconut also tastes nice! keep cooking have fun. Very nice dish! Easy to cook! And awesome taste and curry is the best! wow its so delicious and so simple to make today i wiil try this dish.i want to read all the recepes so which i like i try. thnx. I personally think that 2 tsp coriander seeds is the reason for the bitterness. I was careful to not burn the mustard seeds yet it turned out bitter. Perhaps half a tsp of coriander seeds would be enough. Annie the proportions are exactly same as used for the recipe. Even for other goan recipes we use that much coriander seed. Don’t think its because of coriander seed. Could be something else has gone wrong hope was able to help you. This was fantastic. The curry is so delicious that I forgot abt the prawns far a minute:). Mine did not turn out red more of a yellow curry however I put 10 chillies 5 kashmiri and 5 spicy ones. No corriander seeds so put the powder instead. Was really good thanks!